I am no paid-up – or even subscription-lapsed – member of the Benjamin Britten fan club, having often, heretically, admired him more as a pianist and conductor than as a composer, and at least as often often suspected that his near-stratospheric critical esteem in this country is owed as much to his nationality as to anything else. (The English, stung by the dearth of anything worth listening to between Purcell and Elgar, seem especially prone to such strange nationalism. ‘We’ have plenty of great music, just not from the eighteenth or nineteenth centuries.) Peter Grimes, for instance, has always struck me as far better in terms of its plot than its music, though The Turn of the Screw is a considerably finer work in both respects.Yet, fresh from Garsington’s vapid if enjoyable Mirandolina (Martinů), I realised once again that, in the theatre and in a winning performance, the sceptic in me could be quietened. 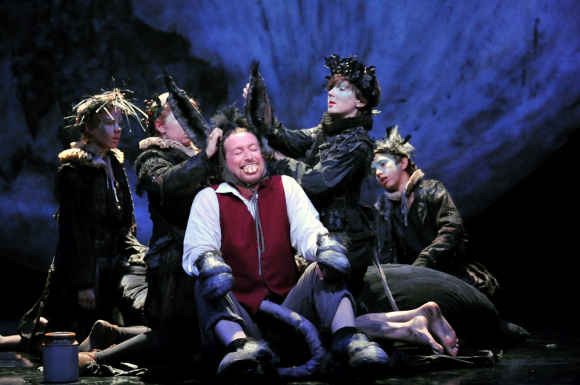 So long as absurd claims are not made for A Midsummer Night’s Dream, it emerges – and certainly emerged at the Royal College of Music – as a more substantial work than many that continue to hold the operatic stage. Ian Judge has directed a great deal of Shakespeare, both for the Royal Shakespeare Company and elsewhere. His experience shows in his familiarity with the text – and also in alertness to its necessary shortening. (Britten and Peter Pears themselves fashioned the libretto.) The stage is formed by a black disc, whose lighting (Mark Doubleday) indicates the world in which the action is taking place. The moon is nearer, or at any rate larger, when we are purely in the realm of the fairies, more distant for the human world. The costumes and acting – here again Judge’s directorial experience shows – indicate that the fairies are far from a pretty, benign presence. There is at least a twist of nastiness to their punk Elizabethan look, quite apposite since Shakespeare and Britten make it abundantly clear that their mischief is far from merely amusing; lives could be wrecked here – and almost are. The composer is not so backward-looking as some of his less helpful advocates would have him, and it is to Judge’s and the musicians’ credit that they both appreciate and project that. After all, mind-altering - and rather more than mind-altering in the case of Bottom – substances are being forced upon the characters. There were a few occasions when the relatively small size of the Royal College of Music Opera Orchestra was apparent, but for the most part it sounded well suited to the acoustic, swelling to a glorious sound in the mock-Romantic music and exhibiting a due sense of the unsettled to other passages. Michael Rosewell has long been an advocate of Britten’s music. There was never any doubt that the score was in safe hands here; indeed, forgetting about hands, it was clearly in his head rather than vice versa. Britten’s music tends to sound strongest when it is – and sounds – most ‘constructed’. Rosewell and his players helped one to appreciate the generative quality of the twelve-note writing – again, the more conservative Britten devotees would surely be horrified to be made aware of this – without neglecting or unduly opposing the magic in the rest of the score. If I became a little tired of certain aspects of the latter – does the composer really need to use the harp quite so often? – then that is no fault of the performance. And the contribution from the Trinity Boys Choir, which has given more than 150 performances of this work, was as excellent as one might have expected from such a figure. The treble voice, both solo and choral, is of great importance to Britten; these young musicians did not fail him. They were rather good actors too, not least in terms of their movement skills. There was a fine sense of ensemble from the rest of the cast, for which honours should doubtless be shared between them, the director, and the conductor. Not all contributions were at the same level, but none was truly disappointed, which is more than one can often say for professional houses. Christopher Lowrey as Oberon reminded us that a counter-tenor need not sound merely fey; the voice, as various composers from Britten, to Goehr, to Birtwistle, have shown, can exhibit an otherworldly strength, as it did here. Luke Williams was the punkest of the fairies as Puck. Normally a baritone, here he was given full rein to display his spoken acting abilities; I am not sure one would have guessed that he is primarily a singer. John McMunn and Madeleine Pierard were the strongest of the lovers, as Lysander and Helena respectively, although Philip Tebb’s Demetrius was probably more strongly acted. Jimmy Holliday’s Bottom was a splendid parody of the over-bearing members of an amateur dramatics society, with the other Rustics working well together. If Alistair Digges’s Flute had seemed a little too light earlier on, the third act play of Pyramus and Thisby signalled a considerably stronger performance, the humour proving quite contagious amongst his colleagues. I was not sure why Alex Duliba’s Starveling was required to carry a (real) dog wherever he went, but it did no particular harm. 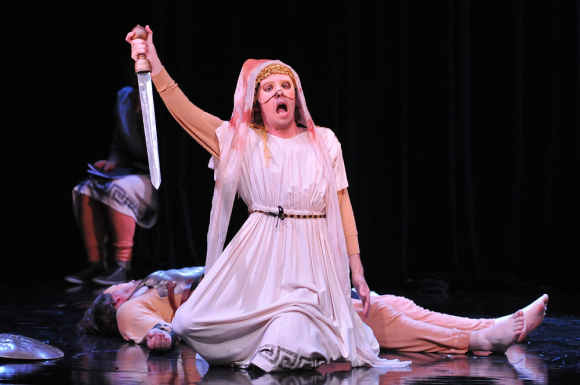 Rosie Aldridge’s duly regal Hippolyta made one wish her part were more extensive, whilst David Hansford, who had stepped in ‘at exceptionally late notice’ as Theseus, would doubtless have made a surer impression in more propitious circumstances. Diction was not always what it might have been, especially, though not exclusively, from Pierard and Anna Huntley’s Hermia. This is clearly something on which the young cast should work, since the problem would be magnified in a larger theatre than this. Nevertheless, the cast should be applauded for a high quality of performance throughout – and not just, or sometimes even primarily, in vocal terms.